Sitting in my yiayia’s overheated kitchen, watching while she labors away kneading on her fourth loaf of olive bread, I try to pin down her true intentions for making such yummy baked food: tradition, habit, necessity? Even though it took until this past summer and a spur of the moment visit for me to finally click why she spends the majority of her time and energy baking the same things everyday, it also finally clicked that I’ve always known her best through baking. It is the one activity we’ve always done together (unless you count me watching her fall asleep to soap operas). But it’s also the one part of her life I’ve known the least about. What I do know is that she bakes for anyone and everyone. She gives dozens of cookies to my uncle to take to his office. She brings baked goods to church every weekend for coffee hours. She sends me boxes upon boxes of bread and cookies (and lemons for that matter). She even sends my friends boxes of cookies. Whenever we go to Palm Desert to visit my yiayia and papou, I might as well be taking a trip to Greece, sitting in one of those small restaurants on the side of the road. I walk into my grandparents’ one-level house and am ushered to the couch for hugs until my yiayia decides I need to eat. I immediately explain to her that we just had lunch but she ignores me and ushers me to the kitchen. Every time I try to tell her, for the third or fourth time, that I’m not hungry and could not possible eat any more food, I get lectured in Greek and feel immediately guilty for not knowing the “language of my people.” Sometimes, trying to avoid the lecture, I just nod along and convince myself and my yiayia that I understand. But deep down I wanted to understand her, without actually having to learn Greek. So my sisters and I decided to start interviewing her. We’ve been recording her every other summer for about six years and we’ve managed to hit nearly every topic in her life: her childhood in Cyprus, her decision to come work in America, and her now 62-year-old relationship with my papou. The one topic we’ve somehow never grazed: why and how she became a baking fiend. When I was younger I dreaded baking with her for no valid reason at all. I was just an obnoxious kid. My mom would ask politely and then eventually guilt me into it – unsure if I would ever do anything in life I didn’t want to without that dreaded Greek guilt. And then about twenty minutes into baking she’d yell at my yiayia for baking way too much and making a mess of the kitchen. But every time I baked with her, and every time I would hear the stories of how long she’s been making these cookies and how much papou loved having fresh bread every morning, I was glad I did it. She would remind me that these recipes and foods had been a part of what she’d been eating before she came to America. Making them, I always figured, was as much a part of her traditions as going to church or continuing to speak the language. But this past summer, as a rising college sophomore, I felt older and that I understood more my “responsibilities” as her granddaughter. My mom had booked last minute flights to Palm Desert because my papou’s cancer was getting worse. 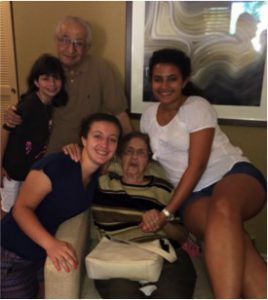 As happy as my yiayia was to see me, she must have sensed that we came so suddenly and for such a short period of time because of the deteriorating state of my papou’s health, a fact my mom and her brothers were trying to protect her from as much as possible. So when my mom left the house to take my papou to his doctor’s appointment, I asked my yiayia if we could bake. Another bad sign to her I’m sure. She looked surprised – I never in my life had asked her to bake. It was always her twisting my arm with that coercive Greek guilt – but I told her that I wanted to really learn these recipes so I’d be able to make them myself. That made her less suspicious. Then she looks at me, without papou there to scare or my mom there to tell her that he’s okay, and starts moaning. She’s so unbelievably frightened about losing him. Sixty years with someone and they naturally become a part of you. I have no way of knowing the feeling but when I try to picture myself in her shoes, it seems unimaginable. As she’s saying these heartbreaking things to me, about how hard it’s been and how she doesn’t know what she’s going to do, she pulls out the ingredients for bread. Once they’re all out on the counter, she turns to me, smiling, and says, “are you ready?” as if the previous moments didn’t happen. In that moment, I understand why she bakes. Yes of course, to help my uncle. Yes of course, to be a generous church member. Yes of course, because it is a very grandma thing to do and she embraces that so much. And yes of course, for tradition’s sake. But also to cope. To cope with a new country maybe. To cope with the stress of learning a new language and working three jobs. And now, to cope with my papou’s sickness. Traditions become habits that become necessary to survive. While I don’t think she realizes that this is why she does it, I fear the day she stops.